"The era of 007 driving awesome cars is over! Burn your old Ian Fleming books and your Skyfall DVDs! We're doomed, man! Doomed!" That's the outcry from freaked-out movie fans on the heels of the news that British superspy James Bond will drive a Fiat 500 in the next film. Details on the 24th installment of the James Bond franchise are set to be released tomorrow, including the film's title, cast and a possible plot outline. Rumors include a villain role by Andrew Scott, who played Moriarty in Sherlock, and a theme song by crooner Sam Smith. 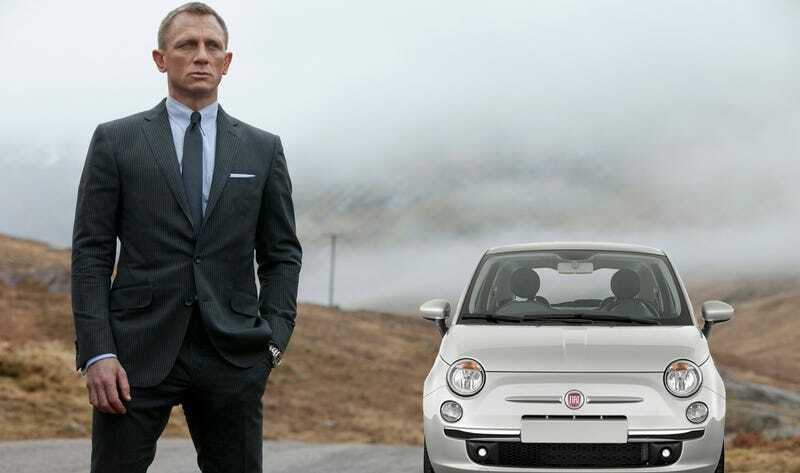 The other report is that Bond will "ditch" his famous Aston Martin for a Fiat 500 in the next movie. Sky News and other outlets say Bond will drive the little car through the streets of Rome in a chase scene, which is due to be filmed next spring. The 500 will reportedly end up getting crushed near the Vatican. Not surprisingly, reaction to the news that Bond will swap his debonair Aston Martin for a cheap, cute-looking city car has been somewhat less than positive. But people seem to think that the Fiat 500 will be the only car Bond drives in the movie — there's a good chance it will be just one of many. After all, Bond has driven a ton of different cars over the decades, including an AMC Hornet and a rented Ford sedan in Casino Royale. He probably just steals the 500 from some hapless tourist for the chase scene, which if it's anything like the famous Mini chase from The Bourne Identity, should be great to watch. Also, we've heard that Bond will drive an all-new Aston Martin in the next film, possibly a DB9 successor. These movies rarely disappoint on the car front, so I'll give them the benefit of the doubt.